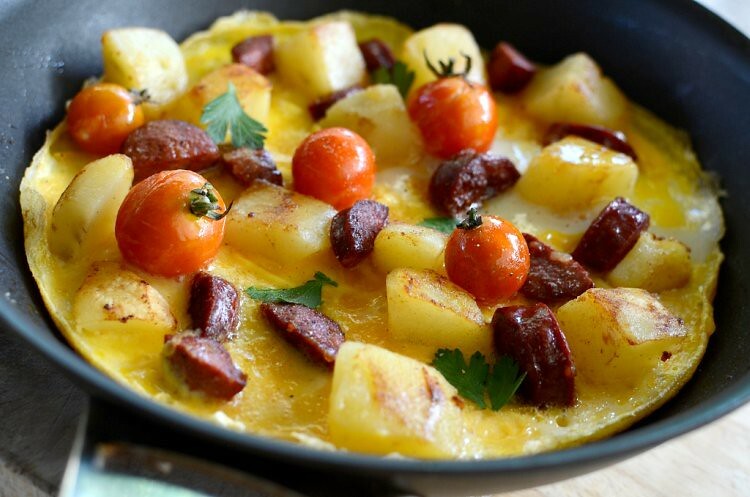 Spanish-style omelette of chorizos, potatoes and home-grown cherry tomatoes. Made a quick brekkie of Spanish-style eggs, like a thinner tortilla, which I ate in Melbourne last year at Chimmy's. Sniffer liked it but then he likes anything charcuteried, which isn't healthy so I limit his intake and it becomes a vicious cycle: the more I limit it, the more he likes it and the more he likes it, the more I limit it. Time is always a constraint isn't it, so I suggest that you parboil the potatoes the night before. Also, cut them thinner than I did. You can throw in some thinly sliced onions too, always good to eat more veggies. I love Spanish food although strangely I didn't enjoy Mexican food (but I love tacos and enchiladas) when I was last in the States. It's time to travel. 1. Peel the potatoes or leave unpeeled, cut into small chunks and boil briefly in water until a metal skewer goes through the center but the potato is still firm. Slice the chorizo into small thin chunks. Whisk the eggs with salt, pepper and cream. You can add the cheese now or at the end. 2. 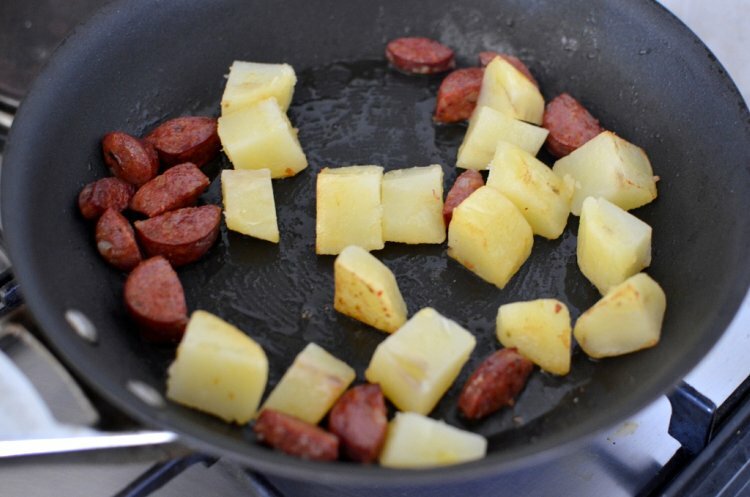 Put 1/2 tbsp olive oil into a non-stick or cast iron pan and fry the chorizos and potatoes until golden. Remove. 3.Heat the same pan again (unwashed), pour in the beaten eggs. Let omelette fry a minute until just firm. If your pan can go into the oven, there's no need to turn, just scatter the chorizo, potatoes and tomatoes over and put pan in at about 200 C, preheated, until the top is set. 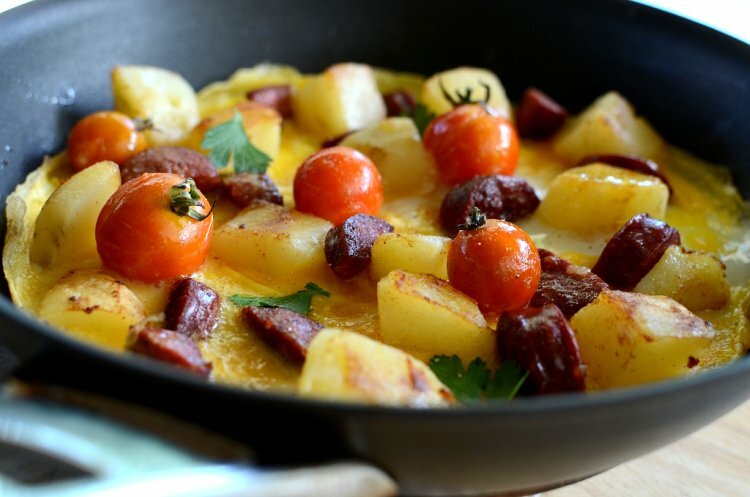 If pan can't go in the oven, continue cooking and scatter the chorizos, potatoes and tomatoes over it and let it cook over medium-low heat until set. You can lift the sides of the omelette to let the uncooked egg run into the pan to cook faster. The omelette cooked over the burner will not look as rustic as that cooked in the oven. You can try turning it over when it's firm enough on the first side and then scatter the toppings over but the toppings may not stick. 4. Sprinkle the cheese over, garnish with fresh herbs and serve immediately with toasted bread. "...in the States. time to travel"..!...... yeahhyes, come visit us here in Arkansas. don't much care for Mexican either but I will make you plenty of tacos, nachos, quesadillas, guacamole- ok, I guess there are some mexican food that I do like.... and also loads of meat for your carnivores- Wai n Wedge. Is early January a good time to visit KK? My son is planning to travel to KK to do nature photography. I wonder if it is rainy season. daedae: raincheck until next year. am really planning on a north american trip, esp to banff, canada. it's been decades since i first went there. why don't we go together, 4 of us? btw, wey said it's 'wey' not 'wai'. pfft, he said. blurting: it is bc the rainy season is now.january is usually drier n feb is very dry bc every CNy the leaves crackle and fire hazards are on high alert. yes, jan shd be good but now until dec is quite cool, esp at night. A simple meal. It looks so yummy! I'll try this at the WE! I realized after I published comment that I spelt Wey wrong but too lazy to go back and redo. So a thousand apologies and to make up, will make yo, Wey plenty of meat laden goodies when you come visit! Thanks Terri, that really helps in my planning. Hi terri, just wanted to ask if you have tried kfc egg tart. The egg tart is nice, and i think it is meant to imitate hk's portugese egg tarts, and now they have the chocolate ones in s'pore. Congrats on your win Terri! I'm sure you'll have a great time in KL. Just read on Yi's FB that you won the competition for the Jelly Challenge. congratulations!! I knew you would be the winner - Yay! I am so happy for you! Congratulations Terri for winning the challange!! Goosebumps goosebumps! Yeah, you made it! Sabah boleh! Yay, you've won! Not surprising really! Congrats!